Double Draw Tarot Bags - Telepathy Double Draw Tarot Bag - Tarot Bags, Tarot Cards, Cloths, & More! Just as telepathy involves the transfer of thought from one mind to another, this pattern symbolizes a similar movement. Swirling patterns of color seem to transform from blue to violet to green to aqua before your eyes. Streams of colors, like streams of thoughts, are shared and ever merging, nearly inseparable. Let this special tarot bag enhance your own natural telepathic talents by its daily connection to you and your tarot cards. Please note: Two bags are shown so you may see more of the fabric. When you click the Buy Now button you are buying one bag. 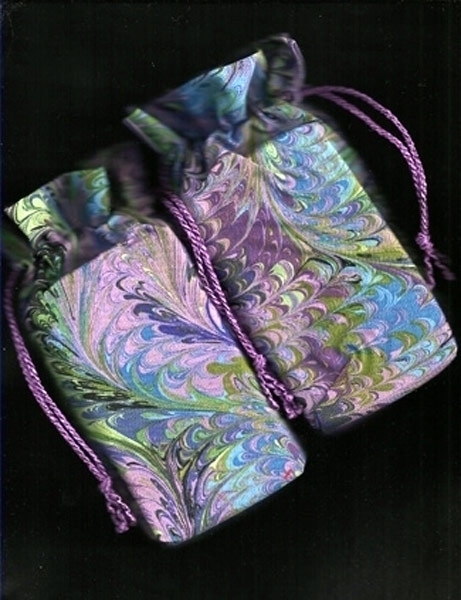 The placement of the book binding paper swirls will vary on each bag.